Last week, we asked Gameological readers to submit questions that we could pose to developers on the E3 2015 show floor. We picked four of our favorites (and carried over one from last year’s batch); those questions constitute The Gameological Questionnaire. David Bowman is director of production at Crytek, which just announced a new virtual reality project called Robinson: The Journey, an upcoming game about a young boy who crash-lands on a mysterious planet. 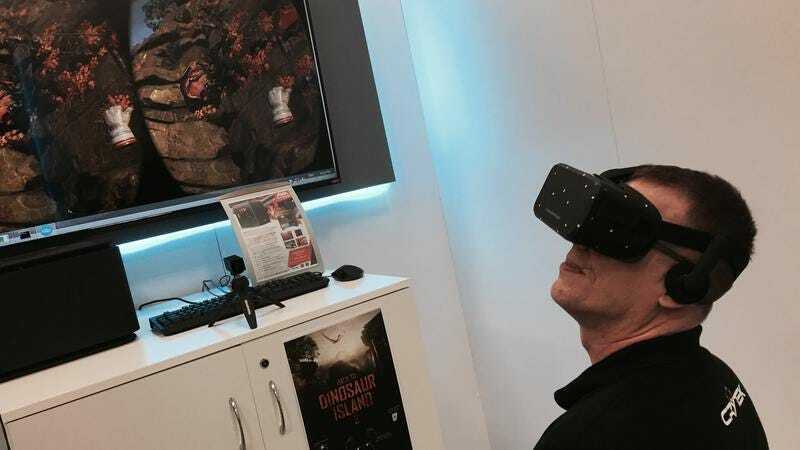 Bowman was reticent to offer any more details about this game, but I got to don an Oculus Rift and play a separate VR tech demo that was a sort of predecessor to Robinson within the studio. In the demo, I zipped up the sheer face of a cliff while avoiding dinosaurs in 3D. After picking up my stomach from the ground, I managed to get some Questionnaire answers from Bowman. The A.V. Club: What’s one thing in your game that took a lot of work to get right but that players might not notice? David Bowman: Oh, wow. Let’s talk about VR in general. In virtual reality, motion is really the critical element because you don’t have a camera that’s controlled by the game. You are the camera. Where your head turns, that’s where the camera looks, so anytime that we take what you see and it differs from what your inner ear tells you your head is doing, you get sick. And so we spent—one small example—we spent 20 different iterations on falling. We said, “Okay. Here. We’ll let go and you’ll fall.” What happens when you fall in VR? Well, you throw up. It’s a bad thing; don’t do it. So all right, okay, falling is a problem. What are we going to do to solve that? We went through 20 iterations trying to get it right until we got to the point where we said the best way to fall, in our experience, is to let you fall just enough so you go, “I’m falling!” and you get that tenseness in your stomach—then we fade to black. And people go, “Okay, I fell, but I didn’t get sick.” If you were to fall in Robinson, that’s probably going to be the final solution that we use, where we fade you to black rather than have you cascade off of rocks and have your camera go all over different directions and make you really, really sick. We wouldn’t want to do that to people. People will take it for granted, just like we do in movies, where you say, okay, what happens when someone is having a conversation between two people on screen? The camera looks over one person’s shoulder, then it looks over another person’s shoulder, and now we take that for granted, and we go, “Oh, they’re having a conversation.” It’s the same thing in our game. In the VR experience, falling—the solution for falling—was, “Oh, he fell. Look, you can see he started to fall, and then it went to black, and that means he fell.” So that’s one small example of just a lot of research that it takes to get the right experience there, and also to build that new vocabulary for people who are doing VR, because VR is different than 2D games. AVC: So did you have somebody that tested it and then ended up throwing up? AVC: If you were to put a retro game into your game, what would it be and why? DB: Retro game into Robinson. Oh, wow. Myst. Do you remember Myst? DB: Myst was an exploration game with beautiful graphics for its time. And Robinson is an exploration game with, I’m going to argue, one of the most beautiful—it’s already, what we’ve evolved already is stunning. There’s a commonality there, so it might be nice to put an homage in there towards Myst. But there’s more to it than just Myst because we’re in a modern generation. But it’s got that Myst-like touch. AVC: If you’d tried to make this game 15 to 20 years ago, what would you have had to do differently? DB: We would have failed. To be blunt, 15 to 20 years ago, that was one of the first—well, not the first. It was the second real serious attempt at VR. We had the large headsets, you know. Industrial-level VR is what we had, so you could have created something, a primitive version of this. You got to see the demo, so you know the visual fidelity, the sense of presence, being there. That would not have been possible with the graphic power that we had available to us that long ago, so it would have had to have been a simulation of it. You wouldn’t have felt like you were there. You definitely would have known you were in a virtual—in a Tron-like world. You could have done something Tron-like with vector graphics, primitive lines, even though we still had 3D graphics then, but we just couldn’t push enough. To do VR, we’re right now doing 90 frames a second in each eye. Every second, 90 frames for the left eye and then a separate 90 frames for the right eye. So you’re doing 180 frames in the time now. That just wasn’t possible back then. AVC: I remember some of the old days of VR. I remember playing one game called Pterodactyl Tag back in the day, so you guys in some ways are like an evolution of that. DB: Absolutely. But if you remember what that visual experience was, it’s kind of hard to remember, but if you rolled back and looked at it—if you went back and saw some images from it—you’d be like, “Oh, primitive.” Right? AVC: Yeah, which is appropriate for dinosaurs. Okay, last question. If your game were the main course of a meal, what would be the appetizer, and what would be the dessert? DB: What would be the appetizer in the product? I’m going to try to interpret this correctly. The appetizer is the thing that whets your palette for the future. It doesn’t satiate you, but it gets you kind of interested in it. The moment you enter our world, you’ll spend… we’ve seen anywhere from five to 20 minutes, just people looking around. They’re so busy being wowed by what they see that they don’t play the game. So that initial burst of “Oh, wow” is like a really great appetizer that just whets your taste for more. And then the main course is all of the exploration, the world, the depth that we’ve put into it, and the whole sense of like, “Wow, this is huge, and it’s really going to fill me up. I’m going to spend all my time in there.” And then I’m going to dessert, and for me, the dessert of this experience is the emotional interaction. We’ve got some emotional features, some things that you’ve never experienced in a game before that comes out of being in VR, and that sense of presence—of really, really being there—and those touches, those flourishes, are the sweet points that end this whole experience. What is your New Year’s gaming resolution?